Jojuin is known as its scenic beauty.Established in the Kamakura Period,the temple has a long and distinguishad history. The site of the temple is a sacred place where Kukai(also known posthumously as Kobo Daishi)held the Goma and Kokuzo Gumonjiho rituals when he went on a pilgrimage in the Heian Period.The temple was founded by the third Hojo regent of the Kamakura shogunate, Hojo Yasutoki, who invited a high priest from Kyoto to pray for the prosperity of the Hojo family. Jojuin was also called “Yasutoki’s watchtower temple’’ as it was built on the top of a hill called Gokurakuji Kiridoshi and served as a citadel for the defense of Kamakura. In 1333, when Nitta Yoshisada defeated the Kamakura government, a fierce battle took place here and the maim hall went up in flames. It was later moved to the nearby Nishigayatsu. During the Muromachi Period, Kamakura continued to be the political center of the Kanto region and was ruled by the Kubo (a title equivalent to shogun ) of Kamakura.Jojuin was a high-ranking temple and its chief priest was invited to the court every year for New Year celebrations with Ashikaga Mochiuji, the fourth Kamakura Kubo. 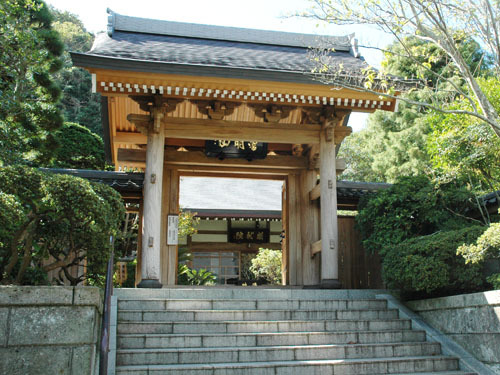 During the Genroku Ere(1688-1703), the high-ranking monk Yuson built the temple at its present location. The principal image of the temple is Fudo-Myo-oh, the God of Fire, also known as the god of matchmaking. Fudo-Myo-oh is an embodiment of Dainichi Nyorai and is known to cut off people’s worldly desires with the sword in its right hand, tie them up with the rope in its left hand, and purify them in the surrounding flames. Kokuzo-do is a small temple tended to by Jojuin and located near the legendary well known as Hoshizuki-no-I (Well of Stars), one of the ten famous wells in Kamakura. The official name is Myokyosan Seisenji. The principal image is Kokuzo Bosatsu, the Buddha of wisdom and happiness. It is said that the image was carved and enshrined by the monk Gyoki during the Nara Period. In the Kamakura Period, the shogun Minamoto no Yoritomo designated it a hibutsu or a closed Buddhist statue to be shown to the public only once every 35 years. Presently the statue is shown on the 13th of January, May, and September, and many worshippers gather for the ritual of Goma which is conducted in a grand scale. Visiting hours: 8 a.m. - 5 p.m. *11/1～3/1*4:30 p.m. Copyright (C) 2015 JOJUIN. All Rights Reserved.